"Caffe" in Italian means coffee and coffee bar. 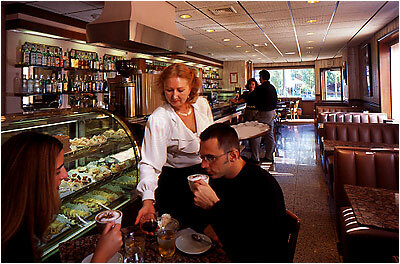 Frequented by all, "The Caffe" is an indisputable center to Italian life and culture. Whether for a breakfast of caffe-latte and a brioche, a quick mid-morning espresso at the bar, a late afternoon aperitif, or to enjoy a gelato in the evening, "The Caffe" is always the perfect place to relax with family and friends. Mozzicato Caffé, the first of its kind, opened its doors in 1978, introducing this Italian tradition in Hartford, Connecticut. The Caffé serves espresso, cappuccino, lattes, teas, Italian cookies, cakes, pastries, gelato and granita, along with a full liqu or bar. Bask in Mozzicato Caffé's warm, relaxed and authentic Italian atmosphere. Bring a date , a friend, family or a business associate to share Mozzicato Caffé's traditional Italian ambiance.